It’s a funny thing, how we can grow up seeing things, but not really seeing them. Most of us have spent time at a “duck pond”, tossing bread and giggling at the resulting feeding frenzy. We haven’t taken much time to think about these birds, the many kinds, the varied ways they go about living their lives, and how they impact us. My nephew Joshua, when he was four, recognized the uniqueness of ducks by noticing that they were the only creatures that could swim, walk AND fly. I guess that is pretty special. The most common duck we see and care for at the Pocono Wildlife Rehabilitation Center is the Mallard Duck. The male mallard, called a drake, is a handsome bird, especially during the mating season. The head is iridescent green with blue highlights, his bill yellow and his chest a warm chestnut. The hen is less dramatic, but her markings are intricate and more well-suited to sitting well-camouflaged on a nest for nearly a month. She has perfectly outlined feathers with blue patches in her wings. We had a record-breaking year for mallard ducklings here at the Pocono Wildlife Rehabilitation and Education Center, raising more than fifty to release. One clutch of nine hadn’t even hatched. According to the note accompanying the eggs, they had been removed from the nest by a homeowner who had a swimming pool but no other water nearby and the person did not want baby ducks in the pool. He or she was kind enough to wait until the eggs had been incubated for approximately 25 days, then dropped them off in a box with a hot water bottle to keep the eggs warm. Luckily, we do have a small egg incubator and successfully hatched all nine! Watching bird eggs hatch is an amazing event. The baby bird has an “egg tooth” with which it cuts an almost perfect circle around the egg, allowing it to climb out, dry off, and with an hour or two to rest, begin to eat and drink on its own. 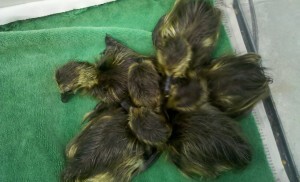 Another three clutches were “storm drain” rescues. You see these on the TV news, and it looks oh so easy…..but let me tell you….. Eric and I almost NEVER have time to go out and rescue animals. They nearly always are brought to us either by the public, or by one of our few trained amazing “capture and transport” volunteers. This time it was our turn. A couple called describing a mallard duck desperately running from storm drain to storm drain where her babies had fallen and wandered from one pipe into another, and another. Gathering nets and pet carriers we drove into a lovely neighborhood in south Stroudsburg where, just as described, the poor mother was running from one grate to the other in an attempt to coax her helpless ducklings from the pipes. These are the things they don’t show on the news. First, the grates must be pried up with large prybars by very strong people. It was Sunday and contacting anyone from the municipality was not going to happen. Luckily, the Stroud Area Regional Police are becoming well-known for their assistance with animal problems, and they came to our aid. Using a heavy crowbar, they pried the drain open. Wonderful! Just catch the little guys and a picture perfect rescue, right? Wrong! Storm drains are not dead-ends. They interconnect, and the frightened ducklings ran from drain to drain avoiding eye contact with us. In the end, three grates were raised, and it took an hour to wait silently as each duckling peered out far enough to be captured in a net. Great! Now mom is supposed to be reunited with babies and swim off into the sunset. Again- wrong! Not only was there no water nearby, but mom flew off leaving her ducklings in the dust, so to speak. So, we raised another brood. Wood ducks are, in my opinion, the most beautiful nesting ducks in northeastern PA. They are shy, don’t hang out in flocks, or generally wait for bread handouts at public parks. He is dapper. At first glance, the drake looks like a mallard, with its green head and chestnut breast. But he has a crest and white feathers outlining his forehead, earline and neck. His eyes are red as is the base of his beak. His chest is a ruddy chestnut, rich and deeply colored. He looks unreal. The hen is more drab, but her markings are subtly beautiful. What makes wood ducks really cool is that they nest off the ground in tree cavities or in human-made duck boxes. It is very safe from predators, and a cozy warm place to incubate eggs. However, there is a catch. When the babies hatch, they cannot yet fly, and so must leap from their home to the ground, which may be thirty or so feet. Luckily, they bounce! You can tell a wood duckling from a mallard by the red tip on the bill of the woodie and also its eye stripe begins behind the eye, where in mallards the stripe runs through the eye. They also have black feet. Wood ducklings require more care than mallards. Keep mallards warm and clean, provide game bird starter, shallow water dishes, and a feather duster for “momma comfort” and they thrive. Woodies live like pogo sticks. They hop and hop and hop, unwilling to eat or drink until their psychological needs are met. We meet this by placing woodies with mallards and the mallards make everything “just cool”. Once in a while I hear of a nest of woodies getting ready to hatch and we can toss in one or two hatchlings and mom will adopt them. Merganser babies are very endearing, but pinch the budget with their huge appetites for tiny feeder fish. Most people finding them do not realize that they aren’t mallards and wonder why they aren’t interested in eating baby duck food. on their bodies to enable them to propel themselves downward when diving for food, that they do not walk well on land, and cannot take off without running across open water. If they land on an icy parking lot or on a frozen lake, they are literally “sitting ducks” unless they can be taken to open water. The call comes in as a person having found “a duck with two broken legs”, Notice the rear placement of the grebe’s legs since it cannot walk well on land, let alone on ice. Following treatment for abrasions, cuts and maybe frostbite, and a few good meals of live minnows (thanks to Woehrle’s Bait Shop in Mt. Pocono) they can be released onto the Delaware River in an ice-free section. We love our native ducks here at the Pocono Wildlife Rehabilitation and Education Center, and we hope you enjoy them too!